Our big concern was where to invest. My folks had done well in the stock market. Kim’s had done well investing in real estate – they owned rental property. Kim and I decided that real estate was the best way for us to go. OK, we’ve all heard lots of landlord-tenant horror stories. Sadly, because of these stories, not many folks view rental property as an excellent retirement vehicle. But consider this: When you retire, if you own 10 paid-for rental homes that average $800 a month in rental income, would the $8,000 a month these homes provide help you to live better during your golden years? Planning for retirement is pretty straightforward, but because it requires time, work and sacrifice, it’s not much fun. By this, I mean you must be willing to live on less than you earn and use the money you save to buy capital assets – like rental property. The thing is, you can’t use your retirement savings to do fun things like go on vacation or buy shiny red things that honk. 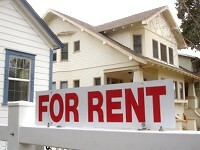 Why did Kim and I choose rental property over stocks as our primary retirement vehicle? Because houses are easy to understand, while the whole stock thing – which stocks will go up and which will go down – is more of a mystery. We felt real estate was a safer investment because everyone needs a roof over their head. Did you know that 35% of Americans don’t own their own home? This means someone needs to provide shelter for these folks. Tenants pay landlords rent in exchange for this shelter. In addition, the government gives landlords large tax breaks for providing housing to its citizens. There’s another great benefit that comes from owning rental property: After write-offs, any income you make is investment income, not earned income. Investment income is taxed at a much lower rate than earned income. Remember: It’s not about how much you make – how much you keep is the important thing! Let’s go back to what stops most folks from owning rental property – the fear of tenants. This fear is unfounded. For example, Kim and I have owned and managed rental property since the mid 90’s. In all this time, we’ve never had a single property trashed and have only taken four tenants to court for nonpayment. Folks, there is no such thing as a born landlord. Landlording is a learned thing. The best place to learn how to be an effective landlord is to hang out with been-there-and-done-that landlords. The best place to meet with experienced landlords in your area is at your local real estate investors association meetings. Hope to see you there! Bill & Kim Cook are a husband and wife real estate investing team. They live in Adairsville, Georgia and have been investing in real estate since 1995. They specialize in buying single-family homes, mobile homes and mobile home parks. They also run North Georgia REIA and teach folks how to successfully invest in real estate.